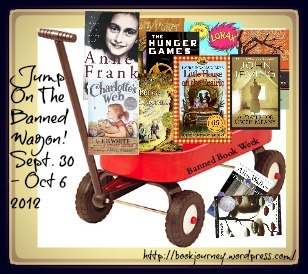 The Relentless Reader: Banned Books Week ~ Are You There God? It's Me Margaret. Banned Books Week ~ Are You There God? It's Me Margaret. I'm joining Sheila at Book Journey by jumping on the Banned Wagon! Many other bloggers are joining in and there are events planned for every day this week, make sure to check them out. The banned book I decided to read was Are You There God? 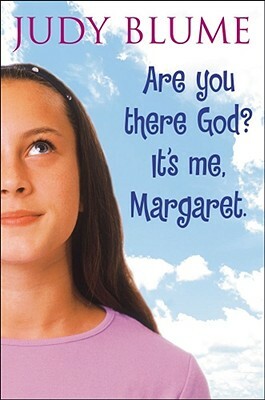 It's Me Margaret by Judy Blume. Margaret Simon, almost twelve, has just moved from New York City to the suburbs, and she's anxious to fit in with her new friends. When she's asked to join a secret club she jumps at the chance. But when the girls start talking about boys, bras, and getting their first periods, Margaret starts to wonder if she's normal. There are some things about growing up that are hard for her to talk about, even with her friends. Lucky for Margaret, she's got someone else to confide in... someone who always listens. The first time I read this I was probably 11 or so. I've had a soft spot in my heart for this book since then, but I had no idea just how much it meant to me until I re-read it this week. I was nearly brought to tears from all of the nostalgia I felt while reading it this time around. One of the first things that I remembered was that I read this while at my grandparent's house one summer. It may have been a book that I checked out from the bookmobile? Maybe I borrowed it from a friend. I'm not sure where it came from. I'm just glad that it found it's way into my hands. Did this book change my life? I'm a girl who loves to exaggerate and I really have to work on not making grand, sweeping statements like that. But! After reading this as an adult and being flooded with memories of the questions this book made me ask myself when I was a young girl? Yes, yes. It did change my life. I grew up in a small town with a non-religious family. This book opened my mind to so many things that I would never have been exposed to otherwise. I know remember that Are You There God? was the first exposure I had to Jewish people. They were on a page, but still. I know now where a lot of my questions about puberty were answered. The questions I was too terrified to ask the adults in my life were answered right there, in this book. I remember now that it was Are You There God? that made me want to tag along with my cousin to church and Sunday school so I could learn more about religion. This book informed my life and fired my curiosity for so many things. I can't believe that this is something that people wanted to take away from me. How dare they? And who could forget the battle cry of a generation? We must! We must! We must increase our bust! That is just classic. Thank you Miss Blume. Thank you from the bottom of my heart! Go forth my readers! Go forth and read all the banned books you can get your hands on! I remember reading this when I was much younger! Such a good book, and a fabulous author! I think I need to re-read more of her books. Specifically Blubber, I remember that one resonating with me. You have a good excuse to reread them since you have an (almost) teenage daughter you can purchase for or get from the library. You know, because the books are for HER, not for you! Wink, wink! I remember reading this as a child and loving it, but I'm scared to re-read it as an adult. I worry it would ruin the lovely memories I have and I'd see any faults that there might be. I'm glad you enjoyed it, but I don't think I'll risk it. I can't blame you for that Jackie :) I was a little nervous too! I adored this book, it tackled subjects I was desperately curious about but had no one to ask. I gave my oldest daughter a copy when she was about 11 and will do they same for my youngest daughter. Even though it is a little dated now it is one of the very few books that deal with puberty issues for preteens. Yes, yes, yes! 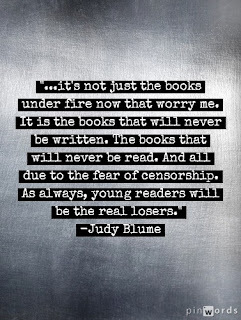 Judy Blume books were my mom/teacher/librarian/doctor all rolled into one. I feel like such a fangirl, I should write her a letter. For reals! I did Jennifer when I was in my early twenties - an email actually, thanking her and she replied! We were reading it together but I had to hustle to get my post done for today so I read ahead of her, lol. She's finishing it up now :) She never wants to like books that her dorky old mom suggests but I've caught her smiling and laughing out loud ;) HA! Wow, that is quite a strong response to a book! And I mean that in a good way. I read the book quickly and I suppose I was a bit older at the time so I didn't think so much about it, but your first response is surely reason to call the banning rather stupid. Yes! I was reading your comment and nodding! I remember that feeling too, just knowing that this was something REAL and important. Thank you for sharing your experience with such a wonderful book! It is amazing how certain books change our perceptions and outlook on the world around us. That the book brought back all of those memories and emotions for you indicates how well it was written and that there was and remains a need for the message. Lol, I remember that battle cry!! And the scary hygiene products they had to use!! I am so glad it wasn't like that when I was entering that era of my life. Lol. My mom gave me this book when I entered puberty - it sparked the "discussion" between us. It was good. But then my mom also bought me the boy version of this book - Then Again, Maybe Not. I don't think she realized it was all about what happens to boys during puberty. It was definitely an eye opener for me at that age! Lol. Oh my gosh, a boy version! I bet that was a giant eye opener, lol. I wish I had read that one back in the day! 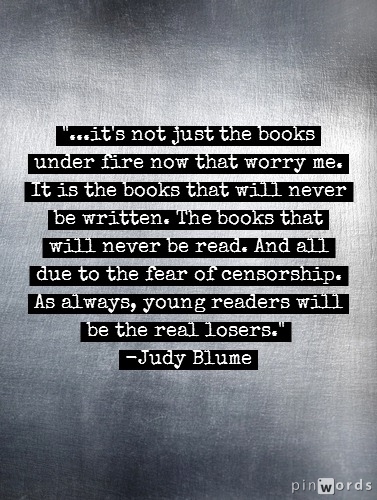 I think it's sad, but important that Judy Blume answered so many questions for so many of us. I wonder if things have changed now, a generation or two later, where the dialogue is a little more open between parents and kids about this time in life. Thanks for reminding us about this great book! This is one of my favorite Judy Blume books. I remember reading it and it left quite an impression on me. I can't wait for my daughters to read this one plus all of her books. I hope she loves them :) I want to re-read more of her stuff now! haha! I loved this book! The books people ban sometimes! Blows your mind doesn't it?? Oh, I LOVED this book so much. I probably read it a dozen times. This is a silly banned book. Makes me roll my eyes. I understand the eye rolling, I did the same! Some of the books on the banned list make my head spin. Banned by one of our local schools, I have yet to read this though it's on my TBR pile. I am not sure why this book was banned? Then again, perhaps this didn't get translated to Dutch :s It does sound like a good book to set those young minds thinking! It explores female puberty..that makes the old white guy's head explode you know! Ugh. No joke Jennifer! I had an absolute ball re-reading this gem. It made me feel like a young girl again...sigh. And to think, if someone, just one someone, had decided that this book should not be available where ever you found it, you would be a different person. I suppose that's why some books scare some people so very much. It does read as a little old-fashioned in our current times (it was first published in 1970 I think) but it's still a wonderful read! I remember reading this and loving it when I was a kid. Not that I'm saying I ever did the "increase my bust" exercise, or anything...well, maybe once. She is awesome :) I keep thinking about Blubber and how I have to re-read that! Loved, loved your review. We had a mobile book library van in the small town we lived in when my boys were little, cool memories. I can't believe I haven't read this one of Judy Blume's and I know she's awesome ... my bad!!! I love that this book means so much to you! I have a confession to make. I much preferred Tales of the Fourth Grade Nothing and Super Fudge to Are You There God? It's Me Margaret. I do know that I enjoyed reading it though and that I thought it funny that people took issue with the book. Even then I knew it was being challenged because of the subject matter covered. And, even then, I didn't get why. Still don't. I don't get it either and I'm pretty sure I never will! It has been so long since I've read this, I don't even remember the main premise anymore. It is one I definitely want to read with my daughter - banned book be damned.